Christmas cookies are good. 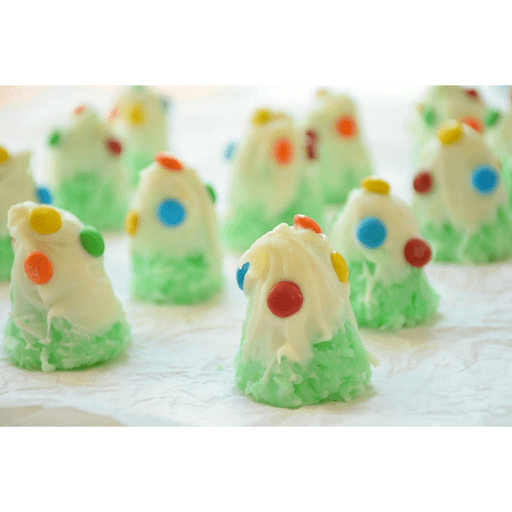 No Bake Christmas Tree Cookies are even better! These festive sweet treats are gluten free, fun to make and almost too pretty to eat. 1. In a large pot, melt butter. Remove from heat. 1. Stir in powdered sugar and milk. Stir in coconut, vanilla and enough food coloring to make the mixture green. 1. Shape into small balls and using the tips of your fingers gently squeeze one side of the ball until it takes on a cone shape. If the mixture gets too cool to work with, heat on low for 1-2 minutes. 1. Place cookies on baking sheet, uncovered, to set either in the fridge for 2 to 3 hours or the freezer for 45 minutes to 1 hour. 1. Melt white chocolate chips in a double boiler or in the microwave, until melted, stirring every 30 seconds. Dip the tops of the cookies in the white chocolate to look like snow. Add mini M&M's. 1. Place in the fridge or freezer to set before storing in an air tight container. Use mint extract in place of vanilla extract. Calories 160, Total Fat 10g (Saturated 7g, Trans 0g), Cholesterol 10mg, Sodium 35mg, Total Carbohydrate 19g (Dietary Fiber 1g, Sugars 18g), Protein 1g, Vitamin A 2%, Vitamin C 0%, Calcium 2%, Iron 2% *Nutritional values are an approximation. Actual nutritional values may vary due to preparation techniques, variations related to suppliers, regional and seasonal differences, or rounding.